A garage rock show is the last thing you’d expect in the party neighborhood of Pacific Beach in San Diego. Legend Records is a tiny sanctuary in the middle of swarms of drunk frat boys. First a recording studio, Legend Records starting doing shows in 2013. One of these shows was Mitski with Elvis Depressedly, Eskimeaux and R.L. Kelly on July 3rd. A favorite of the indie rock world, 24-year-old Mitski Miyawaki (who goes by her first name) has been garnering much attention from the press. The clever song arrangements of her mid-fi garage rock and her tremulous, yet powerful vocals have everyone obsessed. 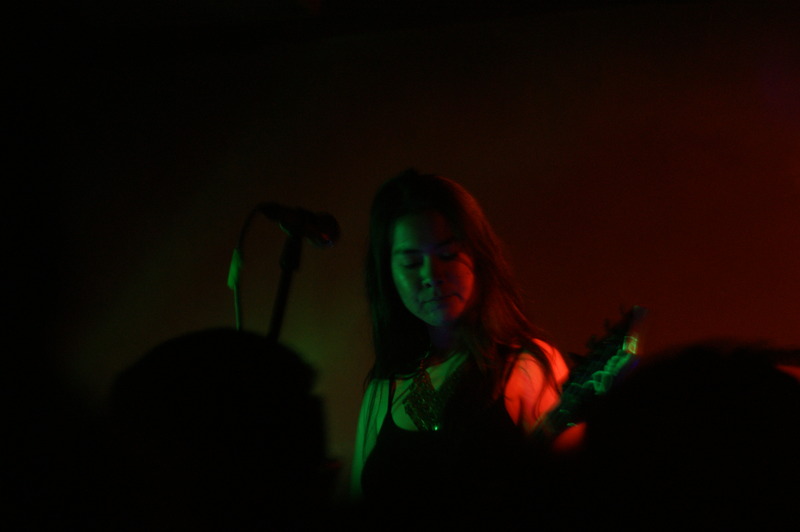 Mitski’s live band included herself on bass and vocals, a guitarist and drummer. Her set started off with the explosive single “Townie,” a angst ridden song about being a bored in small town and feeling like you have no way out. Teen girls started moshing to “Townie,” then upped the pit during Mitski’s second song. Mitski stopped the song early when she saw the girls moving around. “I felt like people were getting hurt in the pit,” she said. Frustrated, the teen girls in the pit walked to the back of the room. Mitski then launched into “Francis Forever,” a catchy tune that starts out as a quiet but then builds up towards the end. Another highlight was “I Don’t Smoke.” The minimalist backup from a drum machine and her hot pink bass really highlighted the power of Mitski’s wavery voice. The dramatic “Drunk Walk Home” gave us goose bumps. Mitski’s intense and personal performance made us feel like she was staring into every single audience members’ eyes. Mitski has two other albums besides the most recent Bury Me at Makeout Creek (yes that’s a Simpsons reference). Her set list was mostly made up of new tracks except for “Class of 2013,” off her sophomore album, Retired from a Sad, New Career in Business. She made innovative use of her guitar on that song by singing into the pick ups. PreviousWin tickets to Jessica Hernandez and the Deltas at the Soda Bar! NextWin tickets to Lincoln Durham at the Soda Bar!